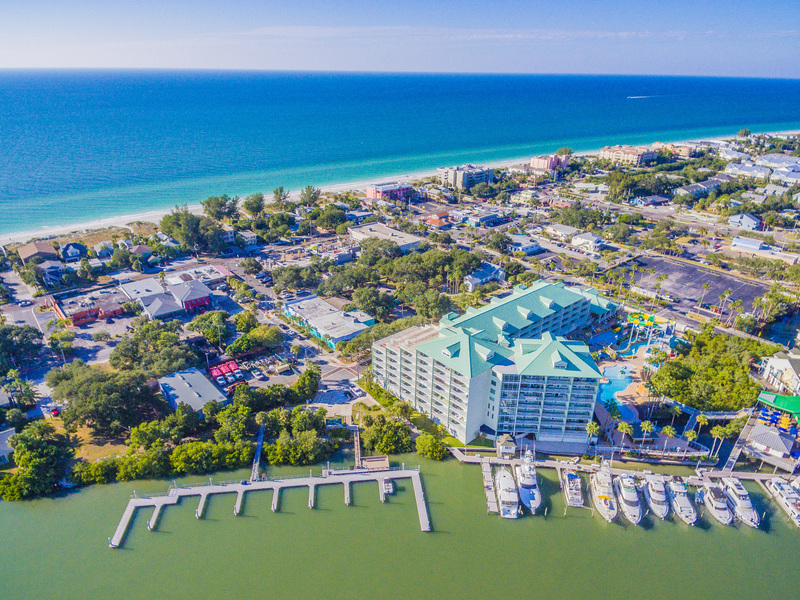 Looking for property in Indian Rocks Beach Florida – Harbourside at Marker 33 Condos are one of the newest condo communities in Indian Rocks Beach. Phase one of this community was the ones that face the intercoastal waterway and have seen prices rise as the first buyers purchased in the low $300,000s to $450,000+ on the low end now as they have experienced rental successes as vacation rental condos this past year. Get the lastest Indian Rocks Beach Condo Market Report. The community is made up of mostly 2 bedroom condos with 8 three bedroom units. This resort community opened up in 2016 however it was slow to sell in the beginning until potential buyers saw the demand for these Indian Rocks vacation rentals did. These condos are located just south of the Walsingham Bridge coming onto Indian Rocks Beach and is on the intercoastal waterway and less than two blocks off the Gulf of Mexico as you can see in the photo and the walkability is ideal. Harbourside Marker 33 condos are a welcome breath of fresh air in Indian Rocks Beach since opening in 2016. One of the big draws for the condo community is that it’s also home to Splash Harbour Water Park – which as you can see from my video it is fun for all ages . We had fun filming with my gopro to help you get to experience it. These newly built Harborside Marker 33 condos are built around the The Splash Harbour Waterpark where everyone can choose a variety of activities. Here the condo guests can enjoy the waterpark at a discount or for free with the owners water daily park passes – each unit comes with 2+ passes and then there is an option for discounted passes too for guests. Indian Rocks Beach locals even are known to come out to enjoy the thrills and spills as well as the long lazy river. No need to go all the way to Busch Gardens when you can ride the high-speed 42 ft water slide or float around in the 600 ft lazy river or hang out at the poolside bar. When you’re an owner you are deeded a specific number of daily water park passes as part of your Condo Association fee for you or your rental guests to fully enjoy. The Splash Harbour Water Park was created to resemble a tropical beach in its looks and atmosphere. It has palm trees, and lazy water clients can relax in while you enjoy the sun. A roof top deck allows visitors a panoramic view of the whole area. At the Harbourside at Marker 33, condos there are units with 2+ bedrooms (and 8 three bedrooms) that guests can enjoy with your family. Furthermore, they can also visit with a group of up to 8 people in the 2 bedrooms and 10 people in the 3 bedrooms so they are very comfortable if you’re looking to come with friends or family and share a condo. One of the things I like best about Phase one of Harbourside at Marker 33 is that each unit has a private balcony to enjoy the action of the boats, jetskis, kayaks are dolphins on the intercoastal waterway as well as with their orientation many also have a view of the Gulf and sunsets. Even if you don’t they have 2 outdoor rooftop balconies on the 6th and 7th floors on the west side of the building that are fabulous spots for seeing over 180 degree view of the Gulf and nightly majestic sunsets. Phase 2 of the development may be condos or the owner may decide to have them be condo-hotels, time will tell. Their balconies overlook Splash Harbour which we will have to see how people feel about less privacy. Another hard to find thing to love about Harbourside at Marker 33 is that it allows pets – especially dogs which is next to impossible to find in a beach condo that allows short term rentals. Condos range in size from 1200 to 1650 square feet. Parking is not assigned currently in this community however there are 100+ spots and enough for everyone to have one – like everywhere on the beach – in season it can get a little tricky parking just about everywhere.